Vaughan’s city councillors are seeking outside legal advice on what to do with a damaging compliance audit into the 2006 campaign books of a municipal candidate. It’s become a familiar refrain at city hall: Similar campaign audits of Mayor Linda Jackson and Councillor Bernie DiVona each prompted council to seek both independent legal advice and ultimately charges. The difference this time is the target of the audit: former mayor Michael DiBiase. Auditors Ken Froese and Glen Davison uncovered several apparent contraventions of the Municipal Elections Act in DiBiase’s campaign records, including overspending his $120,419 campaign limit by $2,712. DiBiase, however, maintains his campaign spending came in under the limit by $4,311. The discrepancy, he said, boils down to Froese and Davison misinterpreting costs associated with a fundraising barbecue — which are not subject to campaign limits — as campaign expenses. The barbecue was advertised as a fundraising event, he said. Gillespie said the auditors’ may not have had all the necessary information before deciding the barbecue was not a fundraiser. Like Jackson and DiVona, whose audits also uncovered apparent campaign overspending, a conviction would bar DiBiase from running in the next municipal election. Froese and Davison also uncovered several instances of the campaign accepting ineligible contributions. “I think many if not most of the concerns raised are either technical or minor in nature,” Gillespie said Wednesday. The auditors also raised questions over expenses incurred by DiBiase during the lengthy recount battle with Jackson following the 2006 election. DiBiase lost to Jackson by 90 votes. Froese and Davison found over $100,000 in legal bills related to the recount were paid to DiBiase’s lawyers by unknown contributors. When asked, DiBiase did not disclose the names of those who paid, and instead produced two legal opinions suggesting he wasn’t required to. “On the advice of my lawyer, I was told not to provide any information and I didn’t,” DiBiase said. But the auditors produced legal opinions of their own, suggesting the opposite. 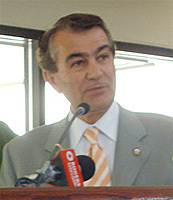 “In our opinion, any legal costs and expenses Mr. DiBiase incurred in connection with his 2006 court application are campaign expenses as defined by the act and Mr. DiBiase is required to disclose those expenses and the source of funding of those expenses,” Robert Rueter wrote in a legal opinion for the auditors. Though Froese and Davison raised several issues about DiBiase’s campaign spending, they were clear in their audit report that the former mayor co-operated fully. That, Gillespie said, gives him reason to believe the audit process can be wrapped up before charges are laid. Though he expressed dismay at how long the audit process has taken, DiBiase said he’s sure the fullness of time will clear his name.